Quote of the Day On, What Does an Organization Trust? A BAH organization trusts its systems, not its people. BAH organizations replace the complexity of human dynamics in social systems with the complication of machine-analogous procedures that enable individual independence, responsibility, and accountability. UCaPP organizations encourage and enable processes of continual emergence by valuing and promoting complex interactions even though doing so necessitates traditional, legitimated leadership ceding control in an environment of individual autonomy and agency, collective responsibility, and mutual accountability. Neither approach is universally appropriate; nor should an organization fall blindly into one or the other without understanding the ramifications and desirability of becoming less (BAH) or more (UCaPP) consistent with contemporary society. 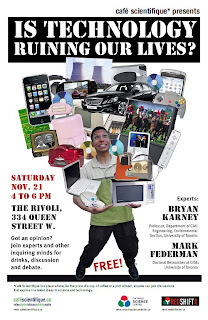 Ontario Science Centre has invited me to participate in this month's Café Scientifique. These are conversations in which a couple of "experts" kick off the musing on the theme of the day with their brief contemplations, and then the audience has at it. The theme for this month is the question, "Is technology ruining our lives?" My short take at the answer: Yes, and it's about time! The theme is an opportunity to explore the nature of our lives in a very large historical, sociological, and cultural context, and to contemplate the possibilities for collectively recreating our lives in today's UCaPP context. 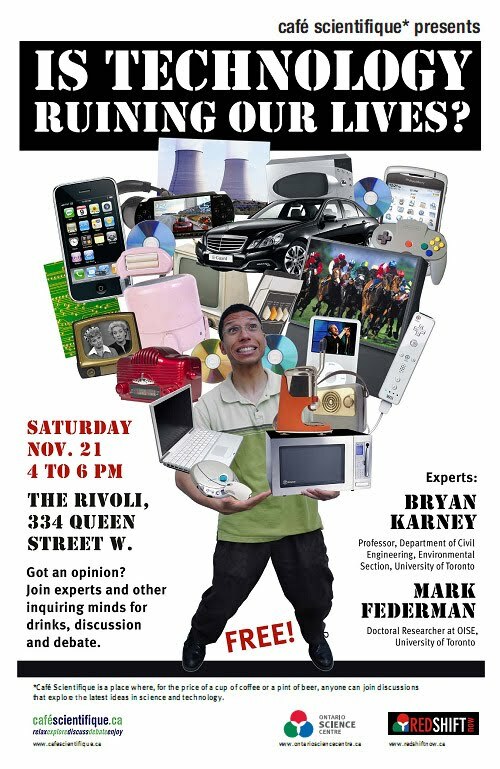 So if you're available in Toronto on Saturday, November 21, from 16:00 to 18:00, join me and Bryan Karney, Professor in the Environmental Section of U of T's Department of Civil Engineering, at the Rivoli at 334 Queen Street West (just east of Spadina on the north side of Queen). No, not for me - one PhD research project is quite enough, thank you. This posting is for a colleague where I was a few years ago. But if you are a woman in a large, hierarchical organization, please read on! Despite their proportion of participation in the workplace, women particularly those from the ethnic minority groups have been disproportionately underrepresented in senior positions in hierarchical organizations. Most of these women are concentrated in low-paying and low-status occupations in these organizations regardless of their education and experience. Various structural and cultural constraints are ubiquitous in hierarchical organizations which limit their engagement and opportunities and compromise their career mobility. This study will investigate how learning in a self-directed and innovative way during the life course can be a constructive intervention for these women in overcoming obstacles arising directly or indirectly from the structure and culture of hierarchical organizations to their career. It further explores if learning through their experience at work will support these women in building new knowledge to improve their career opportunities and in becoming lifelong innovative learners. The study design includes discussions with women who are interested in this study and are able to share their experience relating to their experience in hierarchical organizations and their career development as well as their approach to learning. If you are a member of the study population, i.e. women who have worked in an organization with over 50 employees for over five years and are interested in participating in this study, we would like to have an interview with you. Your participation in this study will enrich our understanding of the research questions with findings that may be instrumental in developing coping strategies to manage the careers of women and in promoting lifelong innovative learning as a constructive intervention. The study is being conducted by Tammy Chan, a doctoral student at the Ontario Institute for Studies in Education of the University of Toronto, under the supervision of Professor Peter Sawchuk. If you wish to participate in the study, you will be interviewed at a time and place convenient to you. The interview will be conducted in two phases by the doctoral student personally and will take approximately two hours and, if necessary, a follow up discussion on any outstanding issues after reflection either in person or over the phone. Dialogues during the interviews will be audio-taped to enhance interpretability relating to the structural and cultural constraints experienced by participants, their career development and approaches to lifelong learning. All the information relating to the research questions collected during the interview will be kept in strict confidence which will only be used for the preparation of the thesis. If you would like to continue your discussion about your experience after the interviews, we will be able to refer you to other professional workers in the related areas. Your name and name of your organization or any other information that may disclose your identify will not be used in the study. To maintain confidentiality, a pseudonym will be used for the report of the findings from your participation. All information about the organization that is discussed at the interview will be kept in confidence. The audio tapes and all related written records from the interviews will only be kept until the completion and approval of the thesis. Your participation is completely voluntary and you may withdraw from the study without further obligations at any time up until the write up of the final analysis begins. Although there will be no financial compensation in participating in this study, we would like to recognize your contribution with a small token of a book certificate. A copy of the final analyses can also be provided to you upon request when available. Please fill in your contact information below if you would like to have a copy. If you have any questions about the study at any time, you may contact us at the numbers below. Thank you for considering your participation in this study. I would also appreciate if you would forward this letter to others who might be interested in this study. Thanks again. So if you have a couple of hours to spare and would like to help out a PhD candidate with her research (I can tell you that all of my participants really enjoyed the process and each learned something new about themselves and their individual situations), please contact Tammy Chan directly. Many thanks - recruiting is often the hardest part of the research process! “If the spotlight is on you, then you’re not doing your job, especially in a leadership role…” says Roger, one of my research participants from a UCaPP organization. Given that the UCaPP organization ideally does not privilege one group or class over another, the espoused leadership concept of personal success only being achieved through group success permeates throughout all organization members, irrespective of their nominal position, role, or tenure with the organization. When considering more traditional organizations, the converse is perhaps more important: collaboration or teamwork that might be expected among the workers cannot be contradicted, neither by the otherwise well-intentioned actions of management, nor the formal and informal compensation and recognition systems in the organization. Reward and recognition are often constructed as rivalrous resources based on the premise of there being beneficial value in creating internal competition in a BAH organization. However, the tacit but clear message received by organization members is that they are always and continually competing for their respective offices unless one has job security via a collective agreement, tenure, or other, similar arrangement. Teamwork becomes necessary in this environment, among other reasons, to establish concertive control in the absence of legitimated and explicit coercion. The collaborative culture of a UCaPP organization decouples reward and status from contribution. In an environment of organization-ba – especially in the presence of strong Socio-psychological-ba and Identity-ba – organization members will contribute not only because it aligns with their personal values to do so, but because they feel valued - strong Economic-ba in doing so. * That ISPs have to proactively police copyright on user-contributed material. This means that it will be impossible to run a service like Flickr or YouTube or Blogger, since hiring enough lawyers to ensure that the mountain of material uploaded every second isn't infringing will exceed any hope of profitability. * That ISPs have to cut off the Internet access of accused copyright infringers or face liability. This means that your entire family could be denied to the internet -- and hence to civic participation, health information, education, communications, and their means of earning a living -- if one member is accused of copyright infringement, without access to a trial or counsel. * That the whole world must adopt US-style "notice-and-takedown" rules that require ISPs to remove any material that is accused -- again, without evidence or trial -- of infringing copyright. This has proved a disaster in the US and other countries, where it provides an easy means of censoring material, just by accusing it of infringing copyright. Michael Geist, as usual, is on top of it with more details (thank you, thank you, thank you, Michael). This is write your Member of Parliament time, ladies and gentlemen. Every organization has an intrinsic motive force – the ideation which provides the impetus for the organization to move. For many organizations, its impetus is expressed by its mission statement that nominally captures its overall goals and objectives. For others, the impetus emerges from its members’ deeply held values that unify in the body of the organization. Regardless of its origin, impetus defines the processes of direction-setting and decision-making, and therefore informs and provides guidance to the mechanisms of management throughout the organization. Setting and meeting objectives is considered important for organizational effectiveness. However, how those objectives are set relates to what we mean by effectiveness. Is it better to set objectives that create visibility for the intended effects and continual reflection on the values of an organization, but may not be quantifiable (and thus, cannot be conventionally measured); OR to set objectives that are quantifiable and therefore can be designed to be accomplished as set, but may not actually achieve the desired or intended effects? Hint: One way is consistent with the practices of UCaPP organizations, the other with BAH organizations. With respect to evaluation in a UCaPP environment, the organization itself must be considered to be a distinct actant in relation with the individual and thus is, as well, a subject of evaluation along with the individual. It cannot be take as axiomatic that the organization is always correct in its often arbitrary selection of goals and objectives, and thus, individual goals and objectives derived via functional decomposition may well be contestable; indeed, in a UCaPP organization, they must be contested and negotiated. The fundamental evaluative concern of the UCaPP organization thus changes from that of the typical BAH organization, asking a different question: In what ways did the individual contribute to enabling and creating the organization's intended effects, and how well did the organization respond?